What are the most popular fruit themed slots? 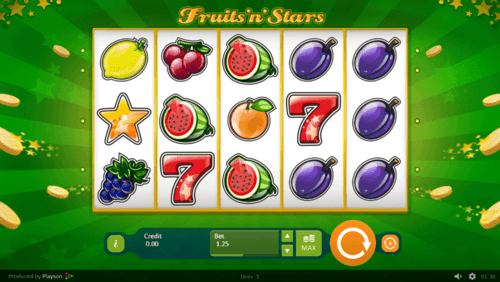 As the most familiar theme for any experienced online slot player, fruit has been popular among the young and the old alike. One of the most searched queries on the internet by online slot players is the best fruit themed slot machines. Here we have compiled a list of them exclusively for your reference after much research and play. Our rankings are based on many factors such as the Return To Player, graphics and layout, ease of use, rewards, bonus features, and user comments among many other elements considered. You will be able to get a clear picture as to which slot machines are more beneficial if you are looking for a profit, and which slot machines are ideal to have fun playing. If you love the candy crush mobile game then here is a casino machine that is similar and comes with impressive prizes. The girls at the counter will see that you are amply rewarded as you go on blasting the stacks of fruits for fun. Every bartender comes with their unique feature, and the Jackpot is a sizable 1000x. There is also a Bonus feature which is activated when you blast a cluster of Bonus Tiles. The RTP of this game is 94.9%, which could be called slightly below the average but having 8 Bonus Features and filled with fun, Fruit Blast Online Slot could be your ideal entertainment for the whole day. 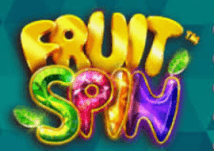 Enjoy what this tropical paradise has to offer while waiting for the Toucan Wild if you like them, and pick some sizable prizes on 720 ways as you spin the reels of this fruit themed slot machine. 3D graphics is surely a highlight of this well designed slot machine but the main event could be the unique 3-4-5-4-3 wager row structure. Win 10, 20, or 30 Free Spins with 2x, 5x, or 10x multipliers respectively, and even better, you can re-trigger them. This slot machine’s RTP is 95% but the entertainment it provides would certainly be 100%. 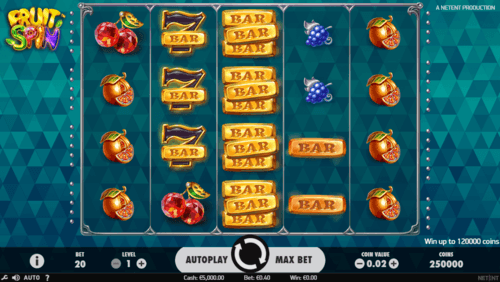 Here is the slot machine which is closest to the traditional fruit machine in our list of best fruit themed slots but a jackpot of 1,000,000 cannot be considered just as simple. With such a high prize at an RTP of 95.72%, this could be considered one of the best as far as fruit machines go. Although it has just 5 paylines the Gamble Feature allows you to double your prize at the selection of 1 out of 2 options. 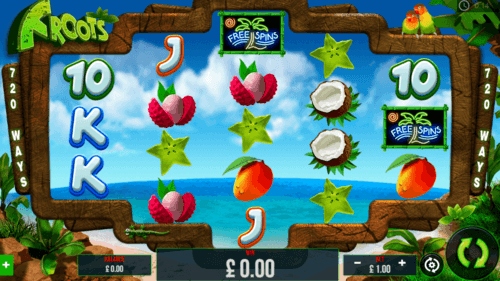 The betting range is £0.10 to £100 making Fruits'n'Stars slot game for entertainment and huge wins alike. 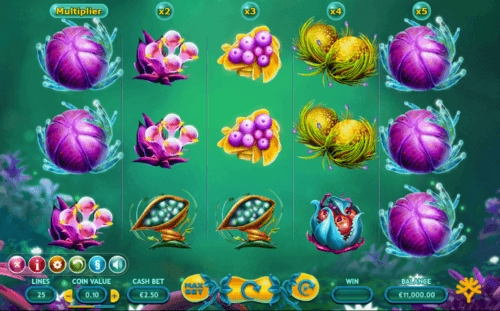 Let the Fruitoids online slot fall as much as you like but make sure to take away your prizes after enjoying it. Because the RTP here is 96.7% and that means you are rewarded better. Another admirable element of this game is the skilfully designed animated symbols which are a thing of beauty. The reels are marked with a multiplier of 1x to 5x from left to right, and there are 25 paylines. A minimum bet of £0.25 is available if you are playing just for fun, but a maximum bet of £150 could be very good news for those who want to win big. When it comes to the traditional fruit machine this could be the ultimate story. A 5x5 structure and 40 paylines are what makes Fruit Spin game different, but a top prize of 120,000 coins would definitely raise this game above its competitors. And the best thing is this game’s RTP of 96.84% for such a fun filled simple online slot machine. There are stacked symbols to award you more prizes, and there are 3x3 Wilds during Free Spins. Trigger the Lucky Wheels Feature, and you would be rewarded even more. This is a fruit themed slot machine totally worth playing.